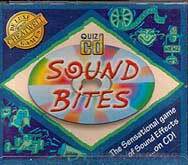 The sensational sound-effects game that tests your recognition of umpteen audio clips or “Sound Bites”! This CD comes stuffed with literally hundreds of evocative sound clips, giving you many hours of entertainment. Played in teams, everybody takes part at the same time… recalling classic lines from the ‘Movies’; solving ‘Sound Effects’; deciding who-said-that in ‘Quotes’; identifying ‘Catch Phrases’ guessing the year from the ‘News headlines’… and much more besides! a fun, engaging 10-round competition, it will use your CD player to the full. Ready straight from the box… you only need to provide the players!